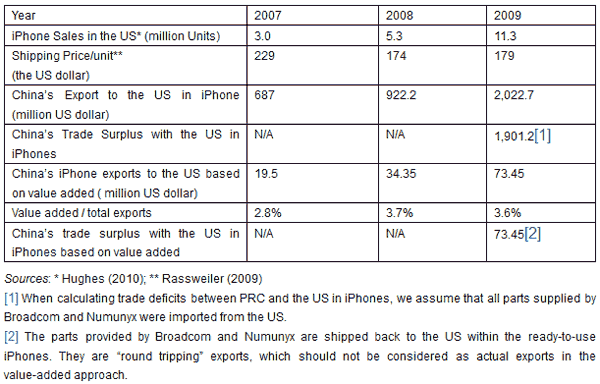 What can the iPhone tell us about the trade imbalance between China and the US? This column argues that current trade statistics greatly inflate the value of China’s iPhone exports to the US, since China’s value added accounts for only a very small portion of the Apple product’s price. Given this, the renminbi’s appreciation would have little impact on the global demand for products assembled in China. Today’s trade is not that experienced by the British economist David Ricardo two hundred years ago (Grossman and Rossi-Hansberg 2008). It is almost impossible to define clearly where a manufactured product is made in the global market. This is why on the back of an iPhone one can read “Designed by Apple (AAPL) in California, Assembled in China”. In this column, I use the smartphone in your pocket to argue that current trade statistics have distorted the reality of the Sino-US trade imbalance and the appreciation of the renminbi would have little impact on the imbalance. On the other hand, most of the export value and the deficit due to the iPhone are attributed to imported parts and components from the third countries and have nothing to do with China. Chinese workers simply put all these parts and components together and contributed only $6.50 to each iPhone, about 3.6% of the total manufacturing cost (e.g. the shipping price). The traditional way of measuring trade credits all $178.98 to China when an iPhone is shipped to the US, thus exaggerating the export volume as well as the imbalance. Decomposing the value added along the value chain of the iPhone manufacturing suggest that, of the $2.0 billion iPhone export from China, 96.4% is actually the transfer from Germany ($326 million), Japan ($670 million), Korea ($259 million), the US ($108 million) and others ($ 542 million). All of these countries are involved in the iPhone production chain. Many believe that appreciation of the renminbi would be an effective means to solve the Sino-US trade imbalance. Appreciation proponents ignore the fact that the appreciation can only affect a small portion of the cost of made/assembled-in-China products. If the renminbi appreciated against the US dollar by 20%, the iPhone’s assembly cost would rise to $7.80 per unit, from $6.50, and add merely $1.30 to the total manufacturing costs. This would be equivalent to a 0.73% increase in total manufacturing costs. It is doubtful that Apple would pass this $1.30 to American consumers. Even a 50% appreciation would not bring a significant change in the total manufacturing cost, as the appreciation would only affect the assembling cost. Therefore, the expected pass-though effect of the renminbi’s appreciation on the price of the iPhone would be zero and the American consumers’ demand on the iPhone would not be affected. The appreciation of the renminbi would have little impact on the Sino-US trade imbalance. •Grossman, Gene M and Esteban Rossi-Hansberg (2008), “Trading Tasks: A Simple Theory of Offshoring”, American Economic Review, 98(5):1978-1997. •Hughes, N (2010), “Piper: 15.8M US iPhone sales in 2010, even without Verizon”, Apple Insider, 6 January. 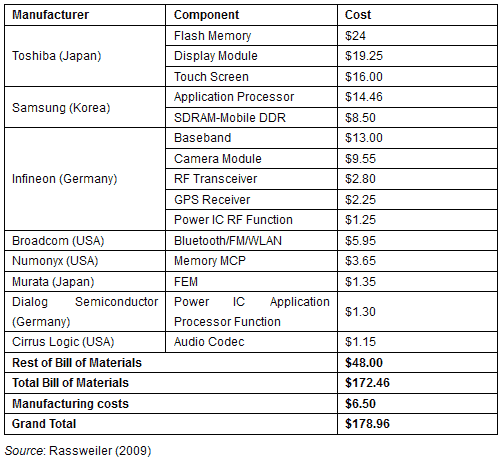 •Rassweiler, A (2009), “iPhone 3G S Carries $178.96 BOM and Manufacturing Cost, iSuppli Teardown Reveals”. iSuppli, 24 June.